The Agency published its proposal(Notice of proposed amendment - NPA) for the operation of unmanned aircraft systems(UAS) in the open and specific categories on 5th May (NPA 2017-05), and the related impact assessment on 12th May. This proposal has been developed by EASA with the support of an UAS expert group composed of representatives of EU Member States, the Commission and of manned and unmanned communities. The NPA is open for consultation until 15th September 2017. In order to receive an initial feedback from stakeholders and in order to facilitate the commenting on the NPA, EASA is organising this event. 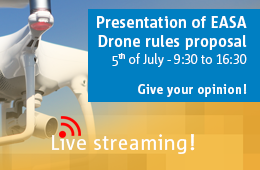 For any further questions, please contact us at drones [dot] workshop [at] easa [dot] europa [dot] eu. As anticipated during the UAS open and specific category workshop held on 5th July 2017, the Agency has prepared answers for all the questions and comments received via the sli.do tool. The answers can be found in the document “EASA Answers to sli.do Questions”. These answers are provided to further clarify the proposal currently under consultation and to assist commenting. The information provided in this document is of a general nature only and is not intended to address the specific circumstances of any particular individual or entity. It may be used as a tool of guidance but under no circumstances may the document substitute officially adopted legislative and regulatory provisions. EASA accepts no responsibility or liability for any actions resulting from the use of the information contained in this document.